Authored by avaldes on Oct 25 2018, 12:27 PM. "Love" token, awarded by abalaji. See bug 399727 for a good description of what this code is for. Very interesting. Is there a programmatic way to detect hardware that would benefit from this? @ngraham afaik powerdevil asks logind for system capabilites, with the CanSuspend, CanHibernate, etc. defined here. I added a new option if logind reports yes for CanSuspendThenHibernate option. We basically just ask logind and it also handles all the background work for it, nothing on our side needed. I'm just not sure we should treat it as "yet another suspend option". 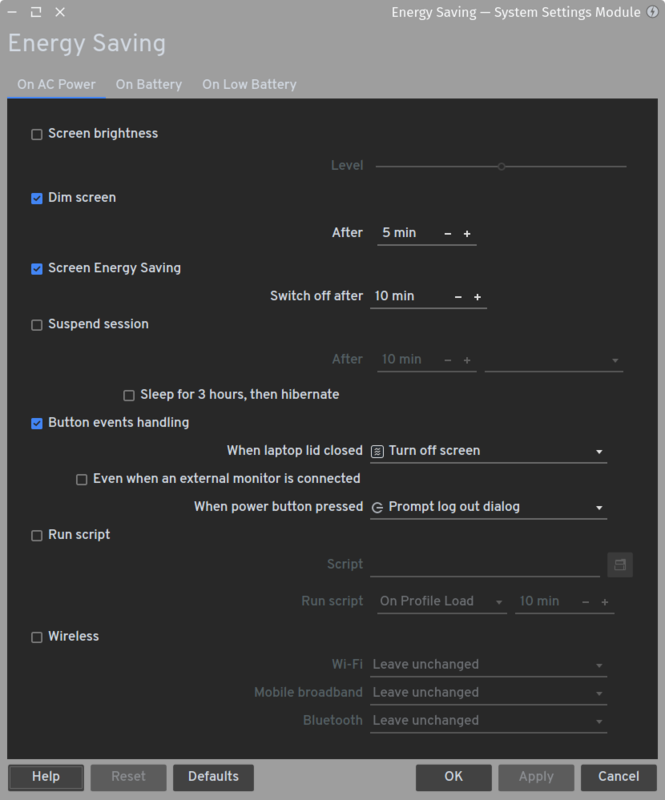 Wouldn't it make sense to have a checkbox in PowerDevil advanced settings to have "Suspend" be "Suspend then Hibernate", or do you only want that when pressing a button but not use it in other circumstances? 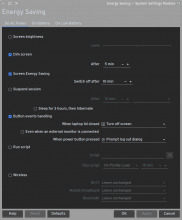 Wouldn't it make sense to have a checkbox in PowerDevil advanced settings to have "Suspend" be "Suspend then Hibernate", or do you only want that when pressing a button but not use it in other circumstances? I agree, that would be a nicer UI. I would suggest to turn "suspend then hibernate" into the new suspend. And one just can specify in the ui how long it takes till hibernate (which could also be endless). I have added a new checkbox inside the suspend session delay and in button event handling. I wasn't able to make it work inside the button event handling config, but the checkbox does work with the logic when added to Suspend Session config and it is enabled. Let me know if you know of a better way to do this. If some of the program’s settings are only applicable in certain contexts, do not hide the inapplicable ones. Instead, disable them and hint to the user why they’re disabled. Exception: it is acceptable to hide settings for non-existent hardware. For example, it’s okay to hide the touchpad configuration when no touchpad is present. It's not exaaaactly the same thing, but I think the principle applies here. If the hardware you are running doesn't support hibernation, logind canSupportThenHibernate method should return no, I tested this code in a machine without hibernation and it currently hides the new option. I added some checks before saving so we don't accidentally enable this suspend option by error. On the amount of time to hibernate, afaik this can only be configured by modifying /etc/systemd/sleep.conf and adding HibernateDelaySec= with the amount of seconds that you want to wait to hibernate, by default the wait time is 3 hours. I have no knowledge of an API to configure this time. I have changed the message. Also, if anyone can help me, I'm having a segmentation fault with these changes when an application inhibits power saving. This does happen with or without having available hibernation in the machine. Is there any manual on how can I debug powerdevil? I wasn't able to find much when searching for it. // Ouch - the application quit or crashed without releasing its inhibitions. Let's fix that. abalaji added a subscriber: abalaji. Were these changes not committed? I still don't have a suspend-then-hibernate option on powerdevil. Is there any way I can enable it? Any suggestions would be much appreciated. We now use the word "Sleep" instead of "Suspend", and now that I look at this some more, I think a better string would be, "Sleep for 3 hours, then hibernate"
Oh and I'm sorry that this patch has sat idle for so long. Once you make my requested change, I'll see if I can help push this along. Thanks for your patience! @ngraham I updated the patch with the comments, I'm not sure if I'm updating it corrrectly, I have tested it on my machine and it can suspend, but for some reason the dedicated keys to change the brightness are not working on my laptop. I'm still checking if this is related on how I build and test locally powerdevil or is related with my changes. So is everything now working for you, or not? No, I can't use my keyboard to change brightness, but it might be related on how I test my changes. I need guidance on how can I test powerdevil changes locally. I applied this patch to v5.15.4 tag and tested with that and it works (my machine is running plasma 5.15.4), I can change the brightness with the keyboard and set the suspend-then-hibernate option. The position of the checkbox in the settings seems odd to me. It would be great to align it below the "After" field. Or perhaps the screenshot just does not justice to the UI. It looks the same as the "Even when an external monitor is connected", I tried using a HBox but it didn't change the alignment, maybe there is a restriction on how powerdevil builds the UI, but I'm no expert on that. if anyone has any idea on how to change it I'm open to suggestions.